The GOP’s Creeping Climate Crackup. Don’t Blame Us. It’s Al Gore’s Fault. I’ve spent some time this past week near the Ilulissat Glacier, the world’s fastest moving ice stream, and quite likely the source of the iceberg that sank the Titanic. The Titanic, of course, made the mistake of charging full speed thru dangerous waters, and was unable to change course in time to avert disaster. This week, following President Obama’s paradigm shifting address on climate change, we continue to see, in the disjointed and muffled responses from the GOP, evidence of a struggle in the wheelhouse. Given the anti-science momentum from 30 years of cultivating the looney fundamentalist, anti-science old-confederacy right wing, a sharp enough turn to avoid a below-the-waterline collision with reality seems unlikely. I posted Eli Lehrer’s recent Weekly Standard essay on saturday. Now we have another piece on the Washington Times website by Chris Ladd, which gives a revealing window into the tortured psyche of the conflicted, not yet quite reformed denier. Climate change is an issue so uniquely suited to the needs of the dying global left that it feels too perfectly tailored to be a coincidence. We are being asked to accept that the accumulating exhaust of the Industrial Revolution is cranking up the planet’s thermostat, threatening to turn our blue marble brown unless we all decide to ride bikes and eat bugs. Now, nobody likes a plate of witchety grubs more than I do, but I’m not aware that entomophagy has become a serious agenda item for scientists or climate change activists. Moreover, it seems to me that ignoring climate change is the course that will most likely lead to a bug’s life. Republicans can’t be blamed for harboring skepticism, but we must realize that our strategy of blind blanket denial is developing into a political suicide pact. “Republicans can’t be blamed” is a key phrase here. Keep your barf bags ready. We’re going to hear a lot of this. The National Academy of Science should have made this clear. Oh. They did? Multiple times since 1979? Well, they should have their own talk radio show. That’s how I get my news. Well, it’s Al Gore’s fault for being so damn snotty about it. How do you expect us to have a rational response to him? He’s overweight. Rush Limbaugh speaks to my values..what? … oh, never mind again. New video of Dr. Marek Stibal talking about his work, and taking samples on the ice sheet on June 25. This is an important new video by Sara Penrhyn Jones, about a little known emerging area of glacial studies. 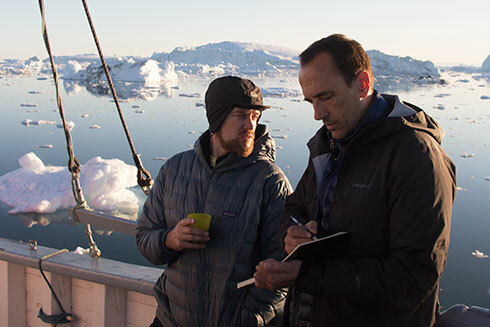 Dr. Stibal is the one of the world’s foremost experts on the communities of living things that survive in the harsh conditions on top the world’s glaciers and ice sheets. These microbes, algae and fungi, survive the intense solar radiation by creating protective pigments, which darken the ice sheet. The question DarkSnowProject and Dr. Stibal are trying to answer is, are human influences fertilizing these life forms, and by creating more melting, encouraging their growth? If so, this could be another important feedback in the darkening and warming of the world’s great ice reservoirs. After bitter cold yesterday, we awoke to bright sunshine and mild breezes. I decided to give the Canon 4ti a test with a time-lapse project, looking west from a soft grassy hump right in front of the Dark Snow Project cottage/HQ. Inside, the team is working intensely with footage we picked up on the ice on the 25th, and interviews shot yesterday new team member Sara Penrhyn Jones, who has jumped right into the flow without skipping a beat. We won’t know more about our transport situation til monday, but as for now, this is time we had planned for media development in any case. See what you think of the time lapse. More sciencey stuff coming soon, but the atmospherics are important to the message as well. Eli Lehrer in Weekly Standard. Time for GOP to Wake Up. If Bill Kristol’s Weekly Standard is publishing acknowledgements of climate science – how much longer can mainstream Republicans pretend to go along with the Tea Party denialist crazies? Former Heartland staffer Eli Lehrer has written a piece for the Standard with a novel proposal. Believe the physics. Believe the markets. Rejoin the real world. President Barack Obama’s climate agenda announced last week represents the latest of many Democratic party efforts to address climate change. Although it includes no new legislation, the president’s plan makes unprecedented use of executive branch powers and offers a great many things that appeal to core Democratic constituencies. Implemented in full, the new power plant carbon rules, further delays in economically beneficial pipeline projects, and added green energy projects would result in a bigger, more intrusive government that exerts greater control over the economy, rewards perceived “good guys,” and punishes supposed “bad guys.” Not surprisingly, the plan, like all previous Democratic efforts, has earned a suspicious and hostile reaction from conservatives. It doesn’t have to be this way. Rather than pretend climate change isn’t a problem, there are ample opportunities for Republicans to point out the obvious flaws in the left’s plans to deal with it and offer alternatives of their own. In short, conservatives can take a page from the liberal playbook and use the climate change issue to push policies that they favor anyway. A detour into the undisputed facts about climate change illustrates why this strategy makes sense. Nobody seriously involved in the policy debate over climate change—not even those the left unfairly labels as “deniers”—actually denies that humans influence global climate. There’s also no dispute that the Earth is warmer than it was before the Industrial Revolution or that carbon dioxide and other greenhouse gases can trap heat energy. Likewise, there’s little doubt that the worst plausible projections of sea level rise and temperature change resulting from this warming trend would present major problems in almost every corner of the globe. While more carbon in the atmosphere could have some benefits, such as fewer deaths from cold, it’s also likely to pose a variety of severe problems ranging from droughts and floods to the destruction of commercial fishing. Nearly any accounting of these costs indicates they will exceed the benefits. On the other hand, the extreme alarmism from some corners of the environmental movement isn’t warranted. The scenarios sketched out by climate models cover a broad gamut of possibilities. And the models themselves remain imperfect. For example, although current overall carbon levels and arctic ice melt are higher than most scientists predicted they would be today, actual temperature changes tend toward the lower end of most models. Moreover, increasing property damage tolls from natural disasters stem overwhelmingly from more people living in disaster-prone areas, rather than fundamental changes in climate. 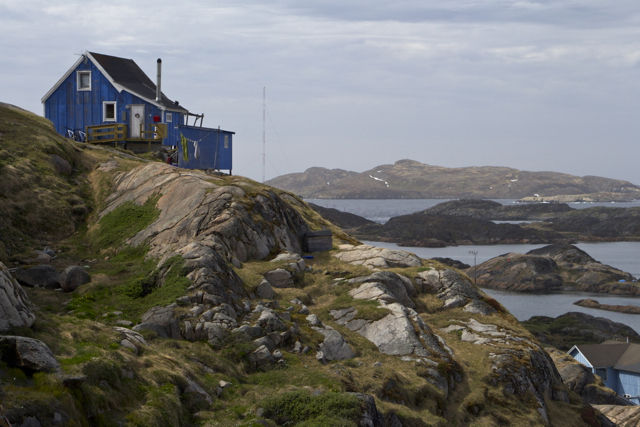 The Dark Snow project Science and media team has set up shop in a small cabin on the outskirts of Sisimiut, on the coast of Greenland. Scientists Jason Box and Marek Stibal, along with myself, will be working pushing out communications, video, still pictures, and narrative over the next several days, while we wait for the remainder of the scientific team to arrive, and for our helicopter transportation situation to clarify. Our originally contracted helicopter provider has been hamstrung by the Danish regulatory system for now, and we were able to fly this week by making a last minute arrangement. Plans for the coming days are being re-evaluated on a daily, and even hourly basis. Dr. Stibal will be heading home tomorrow, as his samples so far indicates that the glacier-based organisms he has been sampling may be at a more advanced growth stage when he returns in August. Dr. Box is busy reviewing budget and planning items, and working with me to go thru the large amount of video and stills we have already acquired, as well as create more interviews and voice-over for an expanding number of interested media outlets. We’ve seen sunshine, rain, snow and fog, sometimes all within the same hour. The only condition that has not changed radically in recent days has been the sun, which is always circling the arctic sky, and when the clouds part, dazzlingly bright. 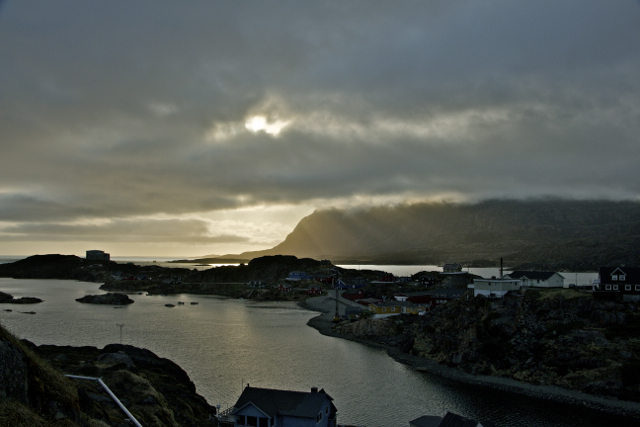 Sisimiut varies wildly between spectacular physical scenery, incongruous and unexpected human dwellings clinging precariously to the outlying rocks, bustling traffic and dreary public housing in the city center. The temperatures have ranged from comfortably cool to biting cold, and today we had snow, that fell but did not stick. The wind comes and goes, but generally remains not far out of mind or ear. Enormous Ravens haunt the rocks around our tiny cottage, babbling as we come in and out, and occasionally bursting out of the shadows with ponderous Tolkeinesque flapping. 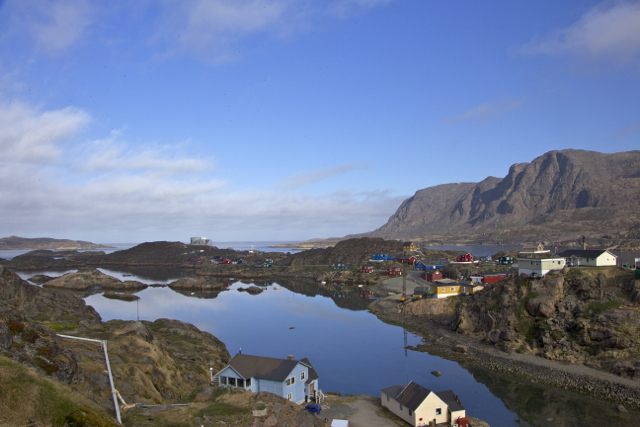 SISIMIUT, Greenland – What started as an improbable vision months ago, struggled through a protracted and difficult fundraising process, and seemed to many a reach too far, has now touched down on the Greenland ice sheet, and begun a citizen-science effort that may help redefine how science is done and communicated to a wider public. 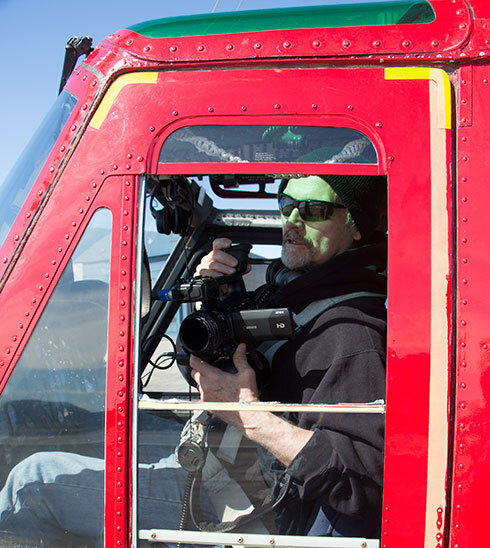 The Dark Snow Project team, Professor Jason Box, Dr. Marek Stibal, Rolling Stone writer Jeff Goodell, and myself, landed on, photographed, and took samples from the Greenland ice sheet on June 25. 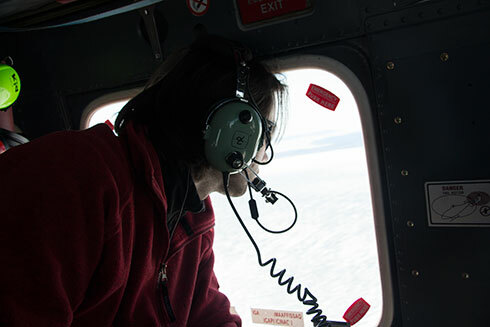 Microbiologist Dr. Marek Stibal peers out of the Air Greenland chopper that took Dark Snow Project scientists to their first touchdown on the Greenland ice sheet. The first research leg involved Dr. Stibal’s sampling of surface ice and sediment for microbiological and chemical analysis. More on this is coming, but Marek’s research is certainly the most novel leg of this project, and may in the end turn out to be the most important. 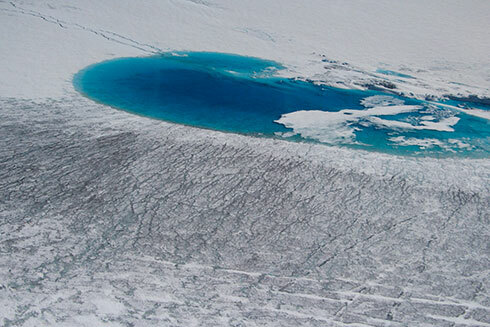 Ice sheet albedo is emerging as a key driver of Greenland surface melt – maybe THE key driver – and one reason could be that human influences are accelerating the growth of the naturally occurring algal community on the ice surface, which further darkens the ice sheet, causing even more solar heating. 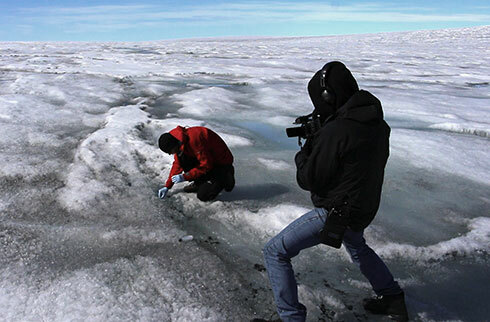 In making our way to the first sample site, we first landed on a recently uncovered piece of rocky terrain that satellite images suggest may have been icebound since an orbitally-forced warm period that ended 3000 years ago. We then flew along the 400 foot calving wall of the Ilulissat glacier, the world’s fastest moving ice stream. Proceeding over the ice sheet a short distance, we identified a darkened area near a striking emerald-blue meltwater lake, where we took samples for about an hour. At every stage our pilot checked carefully with Air Traffic control in Ilulissat, keeping updated on a large fog bank hovering off the coast that could have forced a hasty and expensive rerouting, so time was valuable and every step had a sense of urgency. My post was shotgun seat next to the pilot, where I could shoot out the open window from time to time. The green tinted sun roof adds an entirely serendipitous glow. On the following day, Jeff Goodell had to leave us. Marek, Jason, and I flew to a new location at Sisimiut on the coast, where we’ll be reviewing what is already a wealth of visual material, and begin pushing it out through social media channels, as we promised all our supporters over the last 8 months. Obstacles remain, and the plans for rest of the 2 + week expedition are clouded by doubts about our flight arrangements. Our original helo provider has been grounded for now by bureaucratic snafus between Greenlandic, Dutch, and Danish authorities. We had to cancel our planned flight on the 24th, but were able to find an Air Greenland chopper to fill in on the 25th – shooting fresh holes in our already-strained budget. At this point, we await further word on if and when more flights will be possible. New members of the science and media team will be showing up in coming days, so plans are being evaluated almost hourly in light of what we know at the moment. Our landing zone was chosen from a satellite photo that indicated some low albedo areas, such as here near this meltwater lake, where we finally landed. It’s happening. I’ll be in transit over the next 20 hours or so. We are still in fundraising mode btw. Flight schedule is still in flux, and every donation means more ice time for the scientific team. First stop, Copenhagen, where Dr. Jason Box now holds a position at the Geological Survey of Denmark and Greenland. We’ll be flying from there to Greenland in a few days. Meanwhile,..
Our not so old science of glaciology, beginning in earnest in the late 1950s, can now begin unifying surface and ice dynamics processes at the ice sheet scale. 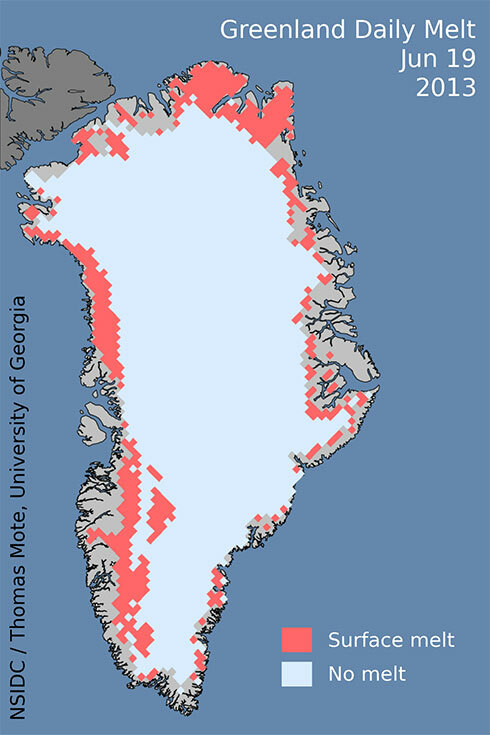 In stark contrast to the messaging that the recent Nick et al modeling study produced, we may expect plenty more sea level contribution from Greenland than current models predict. The misreporting of otherwise good science refers to ice flow to the sea as “melt”. 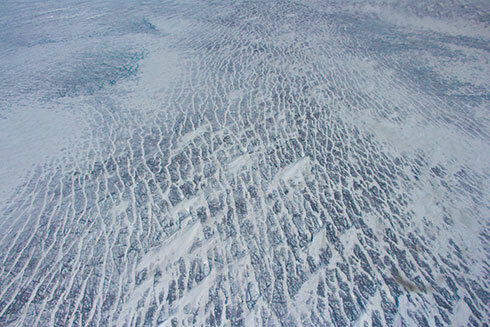 Ice deformational flow is a distinct process from melt. Yet, melt and ice deformational flow are in fact intertwined processes. Self-reinforcing amplifying feedbacks outnumbering damping feedbacks by a large margin (Cuffey and Patterson, 2010, chapter 14) ensure that given a climate warming perturbation, a.k.a. the Hockey Stick, we’ll see a stronger reponse of ice to climate than is currently encoded by models. More on that later.